The notion that human beings eat with the eyes is nothing new. However, it is a one-sided affirmation. Actually we eat using all the senses. 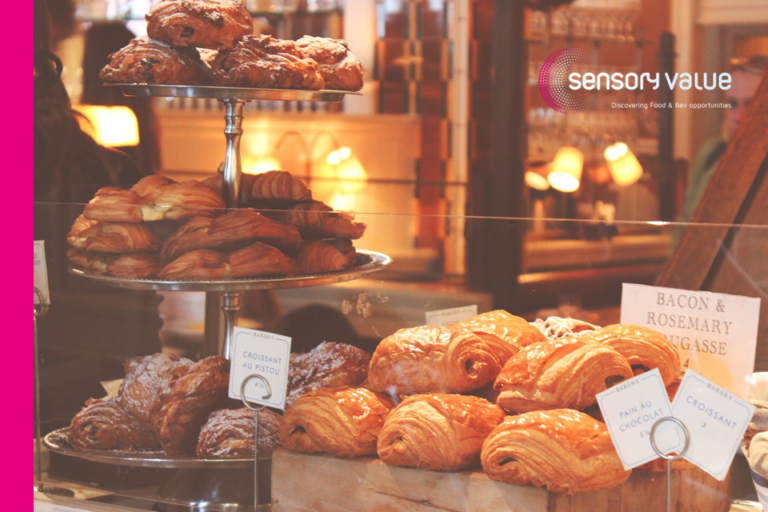 And all this is more than evident when we think about the sensory effect that pastries and biscuits exert on the consumer. The experts in sensory analysis are the people who study all this. Here we give you an overview. There are smells that transport us directly to precise moments of our childhood. Some fragrances are linked to very specific emotions. In fact, perfume advertising is based on these types of associations. Something similar happens in the case of pastries and biscuits. That’s why, when we pass a bakery or pastry shop, the smell of freshly baked bread or vanilla makes us turn our heads. In reality, what we smell in many of these shops is not bread but air freshener containing that particular aroma. The reason is simple: smells that bring back pleasant memories make us want to buy. In fact, it is said that smells and sounds connect directly with emotions, much more than sight or touch. This is the magic of olfactory memory, which establishes links between smells and emotions. Several areas of our body, from the nostrils to the limbic system, work together to create olfactory memories. So when we smell pastries and biscuits, what we really smell is Sunday at our grandmother’s house. Or those moments spent with mother choosing pastries at the local bakery. And when we take a bite out of one of those biscuits or pastries, what we are really trying to bite into is a time in the past that, according to our memories, was always better. The psychology of colour is an exciting line of study. Not only when learning how to decorate to generate specific emotions but also when applying it to any field. Colours are related to very specific moods. Thus, warm colours and cold colours are linked to certain emotions. Food does not escape from these associations; and that includes pastries and biscuits. The natural colour of pastries and biscuits is not only the whole range of ochres but also yellow and almost orange. These colours are related to impulses and not to rational thinking. Yellow is the colour of folly, orange, the colour of happiness. Pastries and biscuits become, then, foods full of life and happiness. But pastries do not only rely on colour. Shapes are also related to emotions and deeper underlying concepts. Biscuits and pastries often have smooth, sinuous, rounded shapes. Only experimental confectionery proposes edges and corners. Rounded forms are associated with effortlessness and pleasure. If you combine warm, comforting colours and friendly, rounded shapes, you find that pastries and biscuits are the perfect representation of immediate pleasure, so inviting that they give us satisfaction almost without us noticing it. There are two textures favoured by consumers of pastries and biscuits: crispiness (or crunchiness) and sponginess. If you look at the advertising for this type of product, it always emphasizes these qualities. Crispy or crunchy on the outside and spongy on the inside has become the ideal formula for successful pastries. We cannot discuss crunchy pastries and biscuits without mentioning Charles Spencer, who, in 2015, in an article for Flavour, stated the following: sound is the forgotten flavour. So much so that the more noise a foodstuff makes when we bite it, the more we like it. Hence our fondness for crunchiness. That’s why we like biting the crusty end of a baguette and love biscuits that break with a loud crack. But what is the hidden reason why the sound of a food seems attractive to us? Well, it seems that our brains, which are responsible for making food seem attractive to us far beyond its taste, have established an automatic relationship between crunchiness and freshness. As for sponginess, what does a spongy texture have that makes it so irresistible? We talked above about rounded shapes and pleasure. The mechanism is the same. Smooth and soft things are pleasant. And human beings are programmed to get greater enjoyment from things that do not offer complications. That’s why our favourite pastries are spongy or fluffy inside – after having convinced us with an initial crunch that they are fresh. Scientists, who attempt to explain why we like what we like, have discovered some curious facts about the behaviour of human beings in relation to taste. It seems that we are programmed to dislike bitter flavours, while, on the contrary, most people’s pleasure sensors are activated when they try something sweet. While “too sweet” is often unpopular, almost no one is put off by a little sugar. Let’s think about the amount of positive expressions related to sweets: a very sweet face, a sweet feeling, sweetness of character, a sweet tone of voice… Pastries and biscuits are sweet and therefore they give us pleasure as soon as we put them in our mouths. Taking precedence over the added flavours of chocolate, strawberry, vanilla, almonds and so on, sweetness is the common denominator of pastries and biscuits. Therefore we find that pastries and biscuits are liked by most people because they appeal to all our senses: Warm, pleasant colours enter through our eyes. Sounds associated with concepts such as freshness deceive our hearing (or don’t). Aromas take us back to moments we remember with affection. And taste, finally, condenses all the above when the food explodes in waves of sweetness that stimulate our pleasure receptors. And so the best pastries always appeal to all our senses. No Replies to "The sensory effect of pastries and biscuits on the consumer"